As parents, I’m sure we’re all aware of the snacking danger zone which occurs when the kids come out of school. They’re usually starving and demand sweets, chocolate or crisps. Offering a nice juicy apple or a banana is usually greeted with a grumpy face and “isn’t there anything else?”. It would be good, wouldn’t it, to have a fun, healthy alternative to hand to placate the little darlings before the grumping reaches supersonic levels. 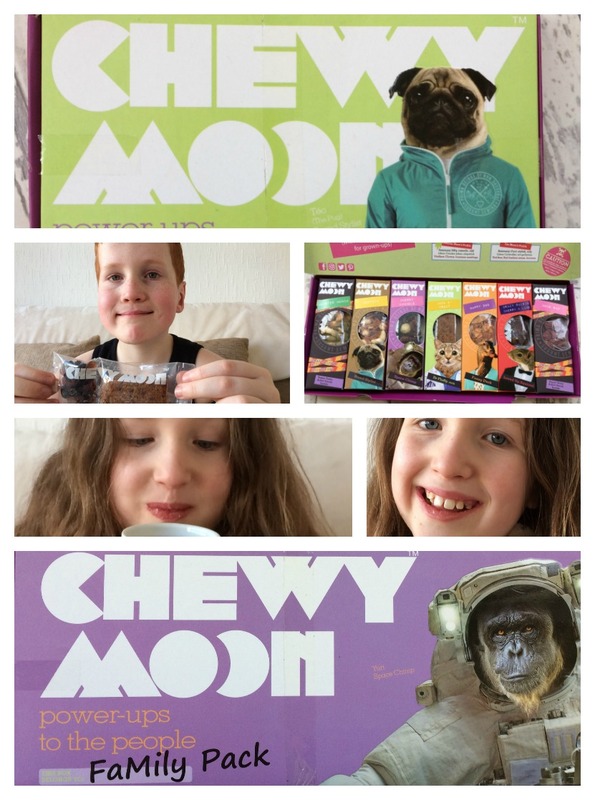 ChewyMoon is a new subscription box service which provides the UK’s first nutritionally balanced snack box for children between the ages of 4 and 10. The company is the brainchild of nutritionist Verena Klanner who has created a range of snacks made from natural ingredients with no refined sugar or nasties. Not only are the snacks age appropriate to meet the differing nutritional needs of kids as they grow but they compare favourably to the traditional healthy option, e.g. that apple! Each box contains 5 different snacks, as well as comics, fact cards and totem toys to make healthy snacking fun. And each snack variety has a cute character on the box. For example, there’s Dr Fluffy Moon, the cat who is clever, passionate and bossy (much like Caitlin and Ieuan) and Yuri Moon, the space chimp who is old, grumpy and adventurous (can’t think who that reminds me of!). So how does the subscription scheme work? You simply select the box you fancy and fill in details about your child. The first box is free and then each weekly box costs £4.93 per child (including postage). Billing is 2 days prior to the despatch of your box and you can cancel at any time. Once you have received your box you can rate each snack online so that future boxes are tailored to the taste of your child. Note that ChewyMoon boxes are NOT suitable for children with food allergies. We were sent samples of the weekly snack box which contained five snack varieties, a fact card, totem toy and comic strip and the monthly family pack which contained seven snack varieties, two of which are specially designed for the adults. Caitlin tried Jack ‘n’ Fruit, (flapjack, orange drops and blueberries) and Ieuan had Cherry Crumble (cherry cubes, cherry raisins and millet balls). A number of the snacks have suspiciously vanished up to the Husband’s loft – particularly Coco Raz (raw coconut chips, raspberries, palmyra blossom nectar, beetroot, baobab and vanilla). We liked the quirky packaging and the fun element to snacking. The snacks are imaginative and tasty, although it would be helpful to have the ingredients of the snack listed on the individual box. These details are available on a separate leaflet containing nutrition facts but first timers won’t know what they’re getting. Arguably though, this adds to the fun. I would also say that while the portion size is adequate, it isn’t huge so you may find hungry kids might eat more than one box at a time. Verena says that the calorie count for snacks for younger kids should be around 100kcal whilst older children and preteens can have up to 200kcal. The individual snack boxes are ideal to chuck in to gym and ballet bags for a healthier fix after exercise (a lot better than our current habit of Werthers Originals or Mintoes). I like the concept of ChewyMoon. If I had one comment it would be that the current box is rather heavy on the packaging but it’s bright, attractive and likely to appeal to kids. The price point is reasonable given the quality of the ingredients, working out at around 98p per snack. If you would like to try ChewyMoon for your child, I have a 1 month / 4 week subscription to give away worth £20. Or sign up for your first week free at www.chewymoon.com. Entry is via the Rafflecopter widget and the usual terms and conditions apply which can be viewed on my competitions page.